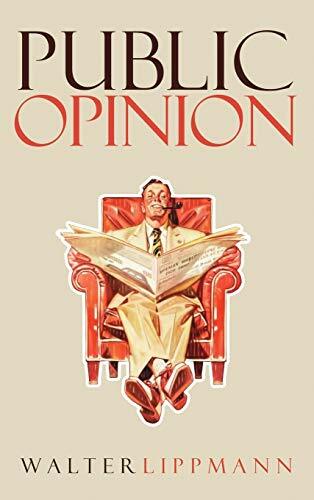 Walter Lippmann wrote his "Public Opinion" at a time when something like the 'mass media' was coming into existence. Prior to the age of electronic communication, the only mechanism for reaching large numbers of individuals was the newspapers. In World War I, he saw how opportunistic nations used the newspapers to serve their often nefarious aims. Lippmann, however, believed that in the hands of super-intelligent, disinterested, omni-benevelont 'experts, ' the 'mass media' could bring about world peace. The school system, the advent of radio, and of course, the television, were arriving or coming along shortly. Each allowed a small group of people the ability to manage a much larger group, inspiring optimism among liberals and progressives that with the right forumula, the horrors seen in World War I would never occur again. Lippmann wrote "Public Opinion" in 1922, shortly after World War I. In 1924, a certain Adolf Hitler would be spending time in jail. If this merited any mention in any newspaper, it is doubtful that no expert paid it any mind. 1939 was, after all, a long way off. If you have any questions about this product by Suzeteo Enterprises, contact us by completing and submitting the form below. If you are looking for a specif part number, please include it with your message.